Venus Williams outslugged Karolina Pliskova to win her third WTA title of the year at the Huajin Securities WTA Elite Trophy Zhuhai and make her long-awaited return to the Top 10. The final was a hard-fought, hard-hitting affair, with Williams coming out sharper - she raced out to an early 4-1 lead - but Pliskova closing in to 4-all before Williams snuck out the opening set, 7-5. The second set script was flipped. This time it was Pliskova who had the leads, going up 4-2 and, after Williams got the set back on serve, going up 4-2 in the ensuing tie-break. The Czech even brought up a set point at 6-5 in the breaker, ripping an inside out forehand that barely missed the sideline. But like she's done so many times on the biggest stages all around the world, the No.1-seeded Williams lifted her game one last time to finally close out the No.3-seeded Pliskova, rifling back-to-back forehand winners - including a huge passing shot on match point - to finish her off, 7-5, 7-6(6). "Seven weeks here in Asia and now I feel like it's my home!" Williams said afterwards. "I'm so excited to win the first trophy in Zhuhai. All the players felt so welcome here and we appreciated all of the enthusiasm. To see every seat filled for every match, that's all the players and tournament hope for. "Also congratulations to Karolina. She deserved to win too - I was really lucky to win at the end." "Even if I didn't make it today, it was a great week," Pliskova said. "Venus played an unbelievable match today. But I'm proud of how I played this week and hopefully we'll have more matches like this." Williams, a seven-time Grand Slam winner and former No.1, has now had her best season in a long time, winning three WTA titles at Auckland, Wuhan and Zhuhai (the first time she's won three WTA titles in a season since 2008) and 41 matches (the most she's won in a season since 50 in 2007). 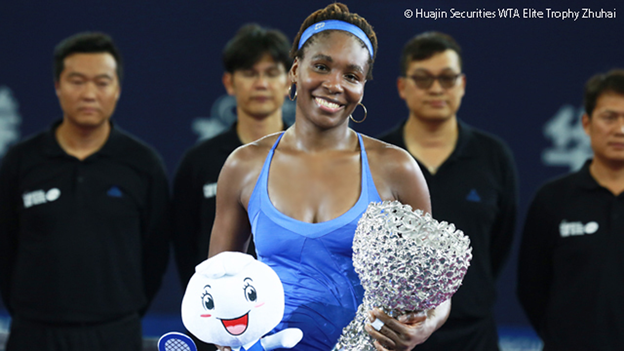 The Huajin Securities WTA Elite Trophy Zhuhai is also the 48th WTA title of Williams' career. And last but certainly not least, Williams will now make a long-awaited return to the Top 10 on the WTA Rankings, the American's first time in the game's upper echelon in more than four and a half years. "It's a great thing to be Top 10 now with the level of the game, but I'm still very hungry. I'm ready for more," Williams said in her presser. "I've had so many experiences in tennis that I still expect a lot from myself. So I'm very happy to be moving forward, but I also want to continue, and not stop here." Why is Williams' return to the Top 10 on the WTA Rankings so significant? Here are seven reasons.